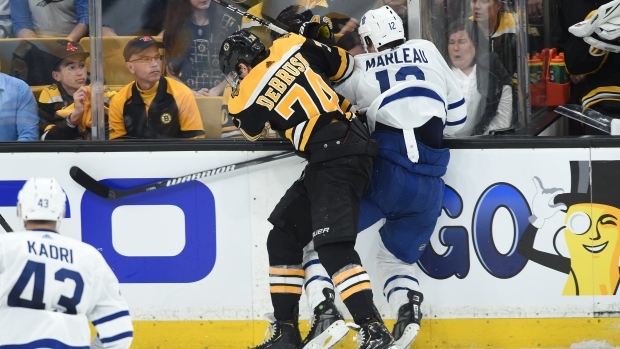 The physicality was cranked up by a few notches in Game 2 between the Toronto Maple Leafs and the Boston Bruins, and at the center of it were Nazem Kadri and Jake DeBrusk. In the second period, DeBrusk laid a hit on Kadri that appeared to be a possible knee-on-knee collision, and led to a brief injury scare for Kadri. Later on in the third period, Kadri took exception with another DeBrusk hit on Patrick Marleau and responded with a cross-check to DeBrusk, leading to an ejection as well as a hearing with the league’s Department of Player Safety. Of course, former NHL agitator Sean Avery decided to weigh in on things... in classic Sean Avery fashion, with plenty of swears. Avery was not a fan of DeBrusk’s decision to go at Marleau! We know Avery likes to sound off, but this may be a multi-game suspension for Kadri. The NHL has offered Kadri an in-person hearing, which means that he becomes eligible for a suspension of six or more games — potentially the rest of this first round series, as well as others to come. As for DeBrusk, he spoke to reporters after conducting a series of tests, and hopes they return negative.